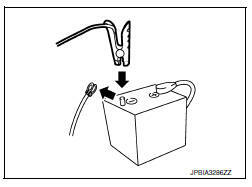 P1551 BAT CURRENT SENSOR (Battery current sensor) An excessively low voltage from the sensor is sent to ECM. P1552 BAT CURRENT SENSOR (Battery current sensor) An excessively high voltage from the sensor is sent to ECM. Is 1st trip DTC detected? YES >> Proceed to EC-377, "Diagnosis Procedure". Check the battery current sensor. Refer to EC-378, "Component Inspection (Battery Current Sensor)".